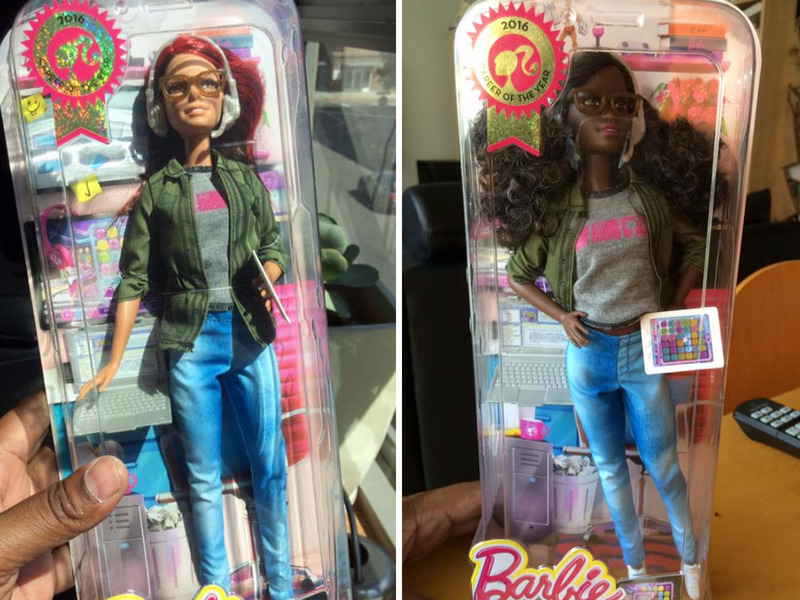 Facebook/Marcus MontgomeryGame developer Barbie, before and after. Lisette Montgomery was thrilled to hear that Mattel recently released a Game Developer version of its classic Barbie doll. But when she went to the store to buy one, she left disappointed and empty-handed: The doll only came in a single light skin tone that looked nothing like hers. Lisette’s husband, Marcus, knew his wife wanted a black version of Game Developer Barbie. And since it didn’t exist, he decided to make one. He purchased a Game Developer Barbie and a Fashionista Barbie with a skin tone that better matched Lisette’s. He took Game Developer Barbie’s clothes, put them on the Fashionista Barbie, and repackaged the doll as a gift for his wife. He posted photos of the process Facebook, where they have been shared hundreds of times. It’s a loving gesture — and a powerful statement on the toy aisle’s historic lack of diversity.